Elementary- The elementary presentations are designed to bring an “Action Plan” and awareness of what bullying is and how students can recognize it. It focuses on simple, role playing scenarios, to train students what to do in certain situations when they witness bullying happening. The message has been referred to as: “The Stop, Drop & Roll of Bullying”. The fun interactive type activities keep the audience entertained, while allowing our words to make a lasting impression on the students, and most importantly, give them the tools to use when they might need them the most. Students learn how to be a "Sweetheart"- (carrier of hope) and "Hero"- (someone willing to ‘“Jump into Action” and do what other are not willing to do), especially the ones that need it the most! Elementary Follow-up Options- Includes a deeper dive into the “5 Bully -Buttons”. It is focused on smaller groups of students, bully drills, role play scenarios, as well as group discussions on our A-B-C Action Plan. We also discuss what the D,E,F,G…options may look like. We can also build these themes into a same day presentation or extended 2-day or more program. Middle/High School- At the Middle and High School levels, Tom and Rick provide an energetic and interactive presentation focusing on bystander empowerment and giving students the tools to #ChangeTheWorld. The crux of the Sweethearts & Heroes presentation are 5 specific “Bully Buttons” that combine to form a call to action against bullying. Also, at many Sweethearts & Heroes presentations, Rick a retired sergeant with the U.S. Army injured in Iraq, gives a message about overcoming adversity and turning a negative situation into a positive one. Rick is one of the world’s leading H.O.P.E. experts. Middle/High Follow-up Options (Cyber)- There are several follow-up presentations that can be shared with the students and staff members which range from a full presentation on Cyber-bullying, to smaller break-out group sessions on a particular Sweetheart & Hero philosophy. These groups could include students that have been identified as “targets,” identified as “bullies” or the most important group, the bystanders that will become Sweethearts & Heroes. Further break-out classifications could include: student leaders or student athletes. We also love passing along our motivational and world class goal setting presentation to any and all groups. Sweethearts & Heroes presents several other perspective changing messages in areas such as leadership, goal setting, commitment and self-discipline. We enjoy customizing these to any audience and promise that they will change the lives of the individuals that attend. Professional Development- Professional development presentations can be tailored to fit a particular time slot and demographic. 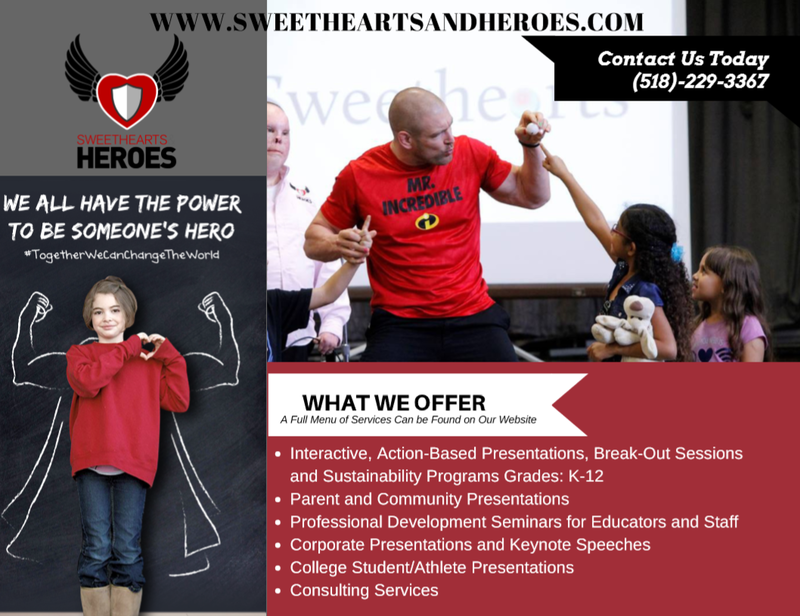 A brief before or after school presentation would include an overview of the Sweethearts & Heroes 5-buttons as they apply to teachers, as well as providing perspective shifts and what highly effective teaching looks like through Sweethearts & Heroes lenses. A more extensive half day or full day experience would focus on providing teachers and administrators with our game-changing 12-pillars for creating a bystander empowered climate and building sustainability in their daily routines, or as we say, a Sweetheart & Hero friendly environment. We uncover the mind-blowing approach for teachers to get a 240X greater effort from students. We guarantee that every teacher will find both professional and personal meaning and catalyst for change. Parent University- The parent presentations are designed to make parents and guardians aware of the Sweethearts & Heroes message their children experienced in school. It focuses on defining bullying vs. conflict as well as educates parents on the principles of compassionate empathy (CE). Parents will also be informed of the role technology plays in their children’s lives as well as the fundamentals of cyber-bullying. It truly closes the holistic loop that we strive to complete between students, teachers and parents/community. We will change the world and individual environments if we can unite and empower all three groups with our life saving and changing message. Bus Driver Experience-Our bus drivers are some of the most important individuals that our students will have interaction with. Many of these individuals are the first and last adults many children see in a school day. They truly have the ability to start and end a child’s day with HOPE instead of hopelessness. Our bus driver presentation is designed to give the bus driving education professional, the training, skills/tools and “action plan”to handle bullying/behavioral related situations effectively. 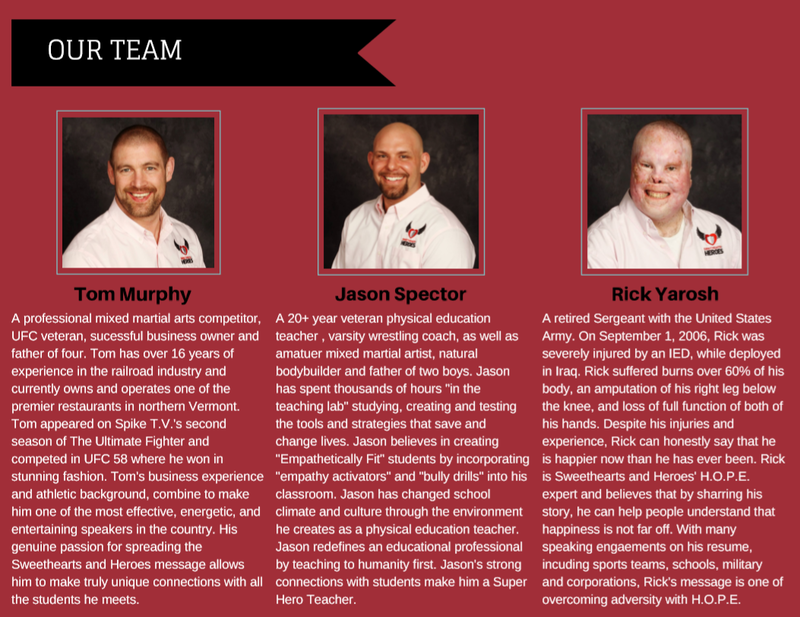 These educational professionals can become some of our greatest Sweethearts & Heroes! NCAA Athletic Program – Sweethearts & Heroes is changing the world. Our NCAA collegiate integrated program is a game changer for college athletes. If there is one thing we know, it’s how to be a student athlete. Jason Spector and Tom Murphy, collegiate athletes and NCAA All-Americans, know this path better than most. Sweethearts & Heroes was built out of their 16th-Century bullying relationship and now they have affected millions with its premise. We tailor our message to fit your athletes and the challenges that they are facing. Popular topics include goal setting, leadership, commitment, focus, self-discipline, healthy relationships and life after sports messages. As part of this program we strongly recommend that your athletes join us in a local school(s) in their community. Many of our young men and women look up to these student athletes as role models. We will help your athlete identify their true superpowers and how they can #ChangeTheWorld, while developing post college, life skills and a commitment of service to others. Corporate Development – One of the most environmental and world changing programs and presentations! Even though our inception was in the educational world, we quickly came to realize that our message changes every environment. From sole proprietors to billion dollar businesses, our foundational principles create Sweethearts & Heroes that change and save the world, and the best part is, it’s FREE! Our mission will be to develop message based on your company’s current initiatives and challenges. We marry our foundational principles to your company’s core values and principles to create a message that will amaze and bring real life changing change to every employee, both personally and professionally. As part of this opportunity, we encourage your company to sponsor Sweethearts & Heroes within a school(s) in your local community. After igniting your work environment for positive, perspective shifting, change we bring our life saving message into your community under your generosity; giving your company all the credit for helping us #SaveTheWorld. Follow the footsteps of some of the great companies that we have worked with such as: Northwestern Mutual, Sysco, CenturyLink and several other proud organizations. Poetry Slam – We have uniquely touched the hearts of thousands of struggling students with the arts and poetry. We end most middle and high school presentations with a memorable original slam poem. As a result, many students, especially the ones that have trouble communicating, fall in love with this method of expression. We have built an entire program around poetry which encourages all students to participate and can even create the most unlikely partners. The program culminates with a community event (much like a community musical performance) that allows the students to perform a poetry slam that will bring the house down! This can be one of the most memorable events your school has ever experienced. Sweethearts & Heroes The Play – Nearly as impactful as our poetry unit, our original play is one of the best ‘head-fakes’ in the gam. Head-fake learning stands for the form of learning that is not obvious at first sight. Students think they are learning something about matter ‘A’ but are, in fact, learning something about matter ‘B’. Our original full length play is laid out, complete with a teacher’s/director’s guide, to train students as they practice the play and connect with each others. The play will end in a community presentation that will inspire everyone in attendance! Empathetic Fitness – Empathetic Fitness origins began in Jason Spector’s Lab. After nearly 2-decades in ‘The Lab’ we have developed a philosophy of training others to become empathetically fit. Just as one trains the body using Frequency-Intensity-Time/Duration (FIT), we also need to strengthen our students’ compassionate empathy muscles. If you don’t use it, your lose it! Our original “Bully Drills” began in the Physical Education classroom, but can be used in any teaching environment. Our lesson plans and training guide bring the Stop, Drop & Roll action plan to any environment that is seeking change and growth! 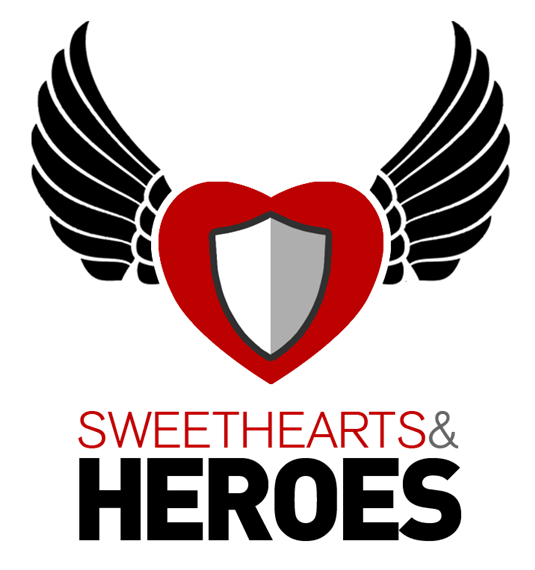 S&H and the Health Care Industry – Sweethearts and Heroes offers professional development in the health care and service fields. The Sweetheart and Hero program starts with identifying and celebrating the inner "Sweetheart" and "Super Hero" that is inside each and every one of us. Much like education, health care professionals play a critical role in a patient's health care experience and ultimate success. We offer soft skill development that enhances the hard skills of each health care professional’s job description. Our simple approach to empathy, hope and super hero action, will prove to be extremely impactful and lasting among any department or team. 13 Reasons Why – S&H Philosophy - The Sweethearts and Heroes approach to "13 Reasons Why", focuses on helping parents navigate the turbulent waters of technology, social media, anxiety, depression and destructive behaviors that students may be swimming in. We must embrace this discussion and work together for a solution rather than allow topics like this to stand on their own. This program allows Sweethearts and Heroes to address these important issues in your schools and community in our action based style. By breaking down episodes and/or scenes, Sweethearts and Heroes can help parents and children translate the issues, make connections to the Sweethearts and Heroes message and ultimately help formulate solutions. Programs like this are more important that ever, as we find ourselves in a time in which suicide and self-harm rates are higher than they have ever been. It is time to break down communication barriers and take action!